Star Wars Icons: Han Solo - This Book Is Pretty Much Amazing! If you like adding books to your Star Wars library collection, specifically books that include art and history about Star Wars, do yourself a favor and order Star Wars Icons: Han Solo RIGHT NOW! I received my copy in the mail today and was blown away at the quality and size of what you get in a book for just $40. There are other books for well over $100 that don’t match the quality, volume, and uniqueness of this one. Don’t wait, because this is currently on sale! Let’s hope they follow this book with other characters from Star Wars Saga! Hasbro Used A Sideshow Collectibles Image For Wolffe's Box Art? In an interesting but not necessarily surprising development, we’ve learned that The Black Series [Phase III] Clone Commander Wolffe 6″ figure’s box art is directly “inspired” by the Sideshow Collectibles one-sixth scale figure. This is not improbable, and Hasbro leased out their license to Sideshow Collectibles years ago to make their high-end figures. Special thanks to JTA reader Jcc2224 for the alert! What Are You Expecting This Year For 2018 SDCC Reveals? It’s hard to believe, but San Diego Comic-Con is right around the corner. Before it begins, we wanted you to weigh in on your speculation of what licensees, specifically Hasbro, will reveal this year at the show. We’ve been hinted since Toy Fair that 2019 will be a year like no other in a very long time, post the Golden Age of Collecting. But will those rumors be revealed to be true? 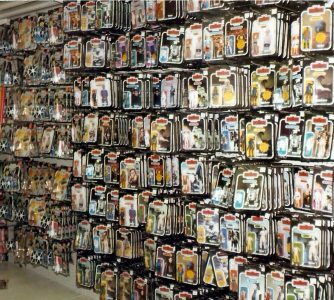 Anyway, let us know what expectations you have for The Vintage Collection, The Black Series 6″ line, vehicles, multipacks, and stuff from other licensees in our comments. ← Brand New The Black Series [Phase III] 6" Figures For $10 At TARGET! The Jyn Erso Premium Format Figure is gorgeous. See why in our Research Droids Reviews today! Be sure to leave your thoughts in our comments section, vote in the poll or even comment about it on our Facebook page. Click the banner below for the direct link to the review! As always, you can also send your review requests via email if you’d like to see something that we didn’t cover yet. Zuckuss is our next sixth scale addition to our Sideshow Collectibles Visual Guide. Click below for the full guide page. Make sure to also check out our full review on this figure. ← Jabba Wants You To BACK THE BARGE! The Sideshow Collectibles Zuckuss 1:6 Scale Figure is gorgeous. See why it is another must-have purchase in our Research Droids Reviews today! Be sure to leave your thoughts in our comments section, vote in the poll or even comment about it on our Facebook page. Click the banner below for the direct link to the review! As always, you can also send your review requests via email if you’d like to see something that we didn’t cover yet. The final two bounty hunters have finally been released in Sideshow Collectibles’ sixth scale line, and they are beautiful! Check out tonights Visual Guide update featuring Dengar. Click below for our full Visual Guide, and make sure to stop by and read our full review right here. The Sideshow Collectibles Dengar 1:6 Scale Figure is fantastic. See why it is a must-have purchase in our Research Droids Reviews today! Be sure to leave your thoughts in our comments section, vote in the poll or even comment about it on our Facebook page. Click the banner below for the direct link to the review! As always, you can also send your review requests via email if you’d like to see something that we didn’t cover yet. This post is your FINAL REMINDER to participate in all 12 contests which are part of our 12 DAYS OF JTA before they all close. Thank you for the tremendous response already. We cannot wait until we announce the winners. But you only have 24 hours left from the moment this article posts to finish them up. So do it while you can! All 12 contests can be found HERE! ← Found! TBS6 [P3] DJ, Rey (Island Journey) And Captain Rex In Canada! Welcome to the 12 Days Of JTA Contest: Day 12! This is the last contest day! Click through to enter! IMPORTANT! We are getting a fantastic response from our readers for the 12 DAYS OF JTA contest. However, we are getting many more comments than we are “entries.” PLEASE BE SURE that you’re filling out the Rafflecopter form IN EVERY CONTEST DAY in addition to whatever the daily task is (an example of what you need to fill out is pictured below). If you see a “check mark” visible (also seen below), you have completed the Rafflecopter portion of the task. Also be sure you’re using a valid email address as it’s the only way we will be able to contact you if you win. If you’re concerned that you may not have filled out all of the daily forms, please CLICK HERE to catch up on all of the contests! THANK YOU AGAIN for your participation. We hope you’re having fun! There is limited time left to complete the previous contests, and we only have one more contest remaining for tomorrow. Good luck to all of our readers! Welcome to the 12 Days Of JTA Contest: Day 11! Click through to enter! Welcome to the 12 Days Of JTA Contest: Day 10! Click through to enter! ← Gamestop BOGO Deal Has Some Great Savings! Welcome to the 12 Days Of JTA Contest: Day 9! Click through to enter! Welcome to the 12 Days Of JTA Contest: Day 8! Click through to enter! Welcome to the 12 Days Of JTA Contest: Day 7! Click through to enter! Welcome to the 12 Days Of JTA Contest: Day 6! Click through to enter! ← The Last Jedi: Talk About The Film Right Here! SPOILERS!!! Welcome to the 12 Days Of JTA Contest: Day 4! Click through to enter! Welcome to the 12 Days Of JTA Contest: Day 3! Click through to enter! If you love Rey, then you’re going to love the Rey Premium Format Figure. But just make sure you get the Sideshow Exclusive version with the incredibly cool extra accessory. See why this figure stands out in our Research Droids Reviews today! Be sure to leave your thoughts in our comments section, vote in the poll or even comment about it on our Facebook page. Click the banner below for the direct link to the review! As always, you can also send your review requests via email if you’d like to see something that we didn’t cover yet. ← Army Build 3.75" First Order Stormtrooper Executioners! Welcome to the 12 Days Of JTA Contest: Day 2! Click through to enter! ← TBS6" Supreme Leader Snoke And Rose For $15.99 On Amazon! Welcome to the 12 Days Of JTA Contest: Day 1! Click through to enter! 12 DAYS OF JTA: It All Starts At Midnight! Get ready! 12 DAYS OF JTA starts at midnight. Click through for a brief summary of what you can expect! It’s amazing how far Sideshow Collectibles has come in a decade. The second “Return Of The Jedi” Boba Fett [Episode VI] Premium Format Figure blows away the previous version. Find out why in our Research Droids Reviews today! Be sure to leave your thoughts in our comments section, vote in the poll or even comment about it on our Facebook page. Click the banner below for the direct link to the review! As always, you can also send your review requests via email if you’d like to see something that we didn’t cover yet. Now let us check out the First Order Stormtrooper Premium Format Figure from Sideshow Collectibles. Find out why this is a great piece in our Research Droids Reviews today! Be sure to leave your own thoughts in our comments section, vote in the poll or even leave comments about it on our Facebook page. Click the banner below for the direct link to the review! As always, you can also send your own personal review requests via email if you’d like to see something that we didn’t cover yet. This Is It? This Is All The 40th Anniversary Of Star Wars Gets?